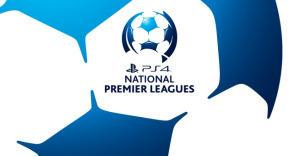 The Match of the Round of Round 18 of the Northern NSW PlayStation® 4 National Premier Leagues (PS4 NPL) was one of the biggest matches of the 2015 season, with the most at stake as Edgeworth Eagles hosted Weston Workers. Edgeworth entered the round in first place, however dropped to second after the Jaffas defeated South Cardiff the day prior. The Eagles knew that a win would get them over the line and see them finish 2015 as Premiers, and if Hamilton lost to Maitland a draw could do the same. Weston began the round in fifth, trailing Magic by goal difference. They needed to win, and Magic to lose or draw to make the top four and the finals series. Edgeworth struck first, going ahead 1-0 in the 13th minute. Tim Pratt saved a Brody Taylor shot but forced a corner, which Aaron McLoughlin whipped in only for Bears captain Carl Thornton to turn it into his own net. Edgeworth looked set to go into the break ahead 1-0 however Thornton stood up for the Bears, making a 15 metre run into the box in the 45th minute, blasting a strike into the bottom left hand corner to send the sides into the break locked at 1-1. Both sides fought tirelessly after the break for their second, however 30 minutes into the half it was still 1-1. In the 76th minute however Edgeworth went ahead as a Keanu Moore strike that beat Pratt was finished off by Dylan Holz who scored into an empty net to make the score 2-1. In the 90th minute Holz looked to have scored a second, however his left foot strike from close range cannoned off the left post. In the 95th minute Weston’s Wilson Edwards brought down Bren Hammel in the box, and the referee awarded a penalty. Hammel stepped up to the spot and hammered the ball into the bottom left hand corner, sealing the 2015 Premiership for the Eagles with a 3-1 win. The players, coaching staff, club members and fans all joined one another on the field after the game to sing the team song, shortly after captain Luke Walker was presented with the Premiers trophy. The result saw Edgeworth finish first and Lambton second. Edgeworth have won an impressive 13 games this year which is a competition best, recorded one draw and lost four times on their way to 40 points. Weston end the season on 29 points following nine wins, two draws and seven losses. They miss out on the top four despite keeping six clean sheets. Edgeworth will now play off in the two leg semi-final series with Broadmeadow for a place in the 2015 PS4 NPL Grand Final, whilst Weston’s season has come to an end. The first match of Round 18 of the PS4 NPL took place at Adamstown Oval as the Rosebud hosted the Newcastle Jets Youth. It was both sides’ last match of the season, as neither could make the finals, or even move up or down on the ladder, with Adamstown sixth and the Jets Youth seventh. The Jets Youth entered the match with a number of regular faces missing due to a first team training camp, holidays, and injury. The Rosebud began the better of the two sides, and went into half time with a 1-0 lead after Nick Bale’s strike on the half hour mark separated the sides. Kim Tae Sung added a second for the Buds in the 72nd minute of the match putting them ahead 2-0. Adamstown looked to be assured of the three points as they entered the 90th minute with the 2-0 lead, however Ben Hay scored late in stoppage time, with his shot taking a huge deflection, which gave the Jets Youth some hope of saving a point. It wasn’t to be as the referee blew full time shortly after the goal, with the Rosebud winning the match 2-1. It was a fitting end to a somewhat successful season for the Buds. New coach Graham Law guided the side to within one match of the Round of 32 of the Westfield FFA Cup, and two places and seven points higher on the PS4 NPL ladder than they achieved in 2014. The Rosebud finish the season in sixth place on 28 points. They picked up eight wins, four draws and six losses throughout the season, missing out on the finals by just four points. They will be disappointed with not making the top four, however in their third year back in the top flight next year they will be expected to make an even bigger impact. The Jets Youth finish just one place below Adamstown, but trail them by eleven points. They won five, drew two and lost eleven in 2015. It was a disappointing season for the Youth side. They were regularly missing players however, and showed flashes of brilliance throughout the season. The second match on Saturday afternoon saw the Jaffas presented with the chance to move to the top of the PS4 NPL ladder, for a night at least, as they took on the South Cardiff Gunners. With the higher ranked Hamilton and Edgeworth playing on Sunday the Jaffas could finish the night in top spot, then hope that results went their way the following day and finish the season as champions. The Gunners’ fate was all but sealed the week before, however there was still a slight chance they may not be relegated if they recorded a large win over Lambton, and Hamilton did the same against Maitland. Both sides battled hard in the first half for the opening goal of the game, however neither could deliver as they went into half time locked at 0-0. The Jaffas eventually scored first as Luke Remington broke the deadlock, scoring in the 52nd minute. Twelve minutes later the Jaffas found themselves ahead 2-0 as John Majurovski doubled his sides’ lead, scoring his tenth goal of the season. The Gunners pulled one back in the 79th minute through defender Phil Buras, but the full time whistle confirmed the Gunners relegation, as the Jaffas picked up a 2-1 win to go first for at least a night. The following day Hamilton lost, and Edgeworth won, so the Jaffas finish the season in second place. They won eleven matches this year, drawing four and losing just three on their way to 37 points. They trailed first place Edgeworth by just three points. The Gunners end the season in tenth after two wins, three draws and a disappointing 13 losses, relegated after 18 consecutive years in the top flight which has seen them make two competition Grand Finals, and win one State Cup Final. Next week the Jaffas will take on Hamilton Olympic in the first of their two-leg tie to determine who will feature in the 2015 Northern NSW PS4 NPL Grand Final, whilst the Gunners will not feature in the PS4 NPL for at least another season. The second match on Sunday afternoon was played at Darling Street Oval, where Hamilton Olympic were playing with a chance at becoming the 2015 Premiers as they hosted ninth placed Maitland. They needed a just point to go past Lambton Jaffas, but with Edgeworth a point ahead Hamilton knew a win was necessary, but may not even be enough. Maitland were playing for pride, and with Charlestown just a point ahead and playing Broadmeadow, they had the chance to move into eighth. The sides went into the break locked at 0-0. Both pushed hard for the opening goal however it was a frustrating half for both sets of attackers. It remained 1-0 until late in the second half when Harry McGuire netted for the away side, making the score 1-0 to Maitland. Olympic were aware that they needed to win, however it was Maitland who scored the second goal of the match, with Joel Wood making the score 2-0. McGuire and Wood’s goals were the only two of the match, with Maitland picking up maximum points with the 2-0 win. It was just Hamilton’s second loss of the year, and was quite surprising considering the hot form they were in that saw them score 20 goals in their four previous matches. They were also the only home side not to pick up three points in Round 18, with Adamstown, Lambton, Magic and Edgeworth all winning at home. They would have felt extremely unlucky with two goals being disallowed, however they will need to regroup and put in two solid performances in the finals series. They finish 2015 in third place following ten wins, six draws and a competition best two losses. Next week they will feature in the first leg of their semi-final against Lambton Jaffas. With Charlestown going down 2-0 to Broadmeadow, Maitland finished the season in eighth place, just two short of the seventh placed Jets Youth. They picked up four wins, three draws and eleven losses this season. With Steve Piggot just announced as their 2016 head coach, expect the Magpies to make more of a push next season. In their first season back in the top flight in twelve years their main goal was not to be relegated which they achieved, but now the club will want to push on for glory. The final match of Round 18 of the Northern New South Wales PS4 NPL saw a confident Broadmeadow outfit go up against ninth placed Charlestown at Magic Park. Magic knew that a win would guarantee them a finals appearance, which looked out of sight after Round 15 when they were six points outside the top four. A win would give them three in a row and a fair deal of confidence going into the semi final against the side who finished the season as Premiers out of Lambton, Edgeworth and Hamilton. Charlestown were simply looking to finish their season on a high, and hopefully in eighth place after a disappointing 2015 campaign. Magic struck the first blow of the game, going ahead 1-0 in the 23rd minute. Dino Fajkovic made a brilliant run down the left hand side, cutting the ball across to Calllan Lewis who buried the close range chance into the bottom right hand corner. Both sides had their chances in the opening 45 minutes, however Lewis’ goal was the only one of the half as Magic went into the break ahead 1-0. It was a similar case in the second half, as the sides produced just one goal. It was Magic again who got on the score sheet, as a 66th minute Peter Haynes free kick sailed into the back of the net to seal the three points, and a finals spot for Broadmeadow. Magic finish the season in fourth after ten wins, two draws and six losses. They now take on Premiers Edgeworth in the two-leg semi final clash to challenge for a spot in the 2015 Grand Final. They would feel disappointed that they left it so late to secure their finals spot. After six matches they were first and undefeated, and they won three of their last three, however a slow patch in-between threatened to derail their season. Charlestown slipped to ninth with the loss after Maitland upset Hamilton. This season they won four matches, drew won and lost 13 on their way to 13 points. After finishing fourth in 2014 they will certainly see this season as a failure, and will looking to make a stronger impact in 2016.